The Grand Awakening exists to inspire yearning and prayer for revival in the Church of our Lord Jesus Christ in West Michigan. 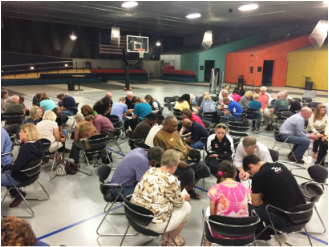 We envision the Church of our Lord Jesus Christ in West Michigan uniting in desperate and humble prayer for God to bring revival in each believer's personal life and in the Church. We see the Lord moving in response to these pleas, in His sovereign time and by His means, to revive, sanctify and empower His Church. As a result of this revival, we envision a great spiritual awakening sweeping our region, resulting in the salvation of the lost, the godly transformation of society in West Michigan, and ultimately bringing blessing to our entire nation. Helping to network movements of prayer in our region toward the goal that we become one in love, unity and purpose. a heart for the salvation of the lost and the godly transformation of society. The Bible to be the inerrant and fully authoritative Word of God and our sole rule of faith and conduct. In one God, eternally existing in three divine Persons – the Father, the Son and the Holy Spirit. We are all created in the image of God, possessing great dignity, and yet, due to the Fall of our first parents, are born sinners and in a state of rebellion against God. In the uniqueness of Jesus Christ, since he alone is fully divine and fully human. That our salvation is by grace alone through faith alone in Christ alone. Randy Hekman, Executive Director. Randy's background is in law, serving as a prosecuting attorney and subsequently elected Juvenile Court Judge. After 15 years on the bench, Randy transitioned to non-profit administration at Michigan Family Forum, CBH Ministries, and then served as Executive Pastor of Crossroads Bible Church in Grand Rapids. His publications include Justice for the Unborn and Truth that Sets America Free. Marcia Hekman, Chief Assistant, prayer warrior, development director, best friend (and wife!) of Executive Director. Mother of 12 awesome children and grandmother to 29.